NAD Viso 1 review | What Hi-Fi? NAD has cut the price of the Viso 1 to £399 (we tested it at £500). Given how popular iPod docks have become in recent years, it’s surprising that hi-fi specialist NAD has taken so long to launch one of its own – but its new Viso 1 system has been well worth the wait. In fact, it’s good enough to worry class-leaders such as the Geneva Model M, which is some achievement for a first-time effort. Of course, not being the first to market does have its advantages, and it’s clear that NAD has spent a lot of time poring over its competitors’ efforts to help hone its own product. If you can see hints of the B&W Zeppelin in the Viso 1’s design, we’re not at all surprised: everyone in the office made precisely the same observation the moment the NAD emerged from its packaging. That’s not necessarily a disadvantage, mind you. The Zeppelin is a looker, so it follows that the Viso 1 is, too: while it’s surprisingly light, especially compared with the hefty B&W, it certainly looks as upmarket as it ought. As an added bonus, its slightly squarer proportions (48cm wide and 26cm high, against 64cm and 17cm for the Zeppelin) mean it occupies a smaller proportion of your desk, shelf or table. The Viso 1’s docking cradle provides further evidence of NAD’s thorough benchmarking. Like the similar assembly on the B&W Zeppelin Mini, the Viso 1’s can rotate through 90 degrees to allow for landscape orientation of your iPhone or iPod Touch, a desirable asset for fans of iTunes’ Cover Flow feature. But here, it’s made all the more attractive because NAD has incorporated a clever clamping mechanism to lock your portable in place, avoiding the unwelcome ‘sagging’ effect that can afflict the Zeppelin Mini’s dock. Even the arrangement of key controls is superior to the Zeppelin: alongside volume up and down, there’s a dedicated source button on the Viso 1’s central metal ring, so – unlike the B&W – you can easily switch between inputs without having to use the remote control. That’s handy, as is the fact that the NAD’s simple remote works well. The Viso 1’s internal arrangement is just as thorough. Its drive-unit configuration has been deliberately kept simple, with just a pair of (relatively) full-range 7cm drivers plus a 15cm subwoofer: NAD’s argument is that this configuration helps produce a clearer, more articulate sound than a design with more drivers can muster, although the firm also (rightly) pinpoints that opting for fewer drive units allows for more to be spent on the quality of each. This drive unit array is fully exploited by the NAD’s all-digital amplifier topography. It’s based on tech used in NAD’s Direct Digital platform, as found in the company’s high-end M2 hi-fi kit. Here, each amplifier is directly coupled to a specific speaker, doing away with the need for a passive crossover. That’s matched by a direct digital input path for your iPod or iPhone, plus a digital volume control. There’s also an optical input which, uniquely for a product in this class, can accept high-bitrate audio files of up to 24-bit/96kHz quality. There’s no provision for AirPlay but, if wireless music is your thing, you’ll find the Viso 1’s aptX-enabled Bluetooth technology works just as well, and is also compatible with a wider range of portable devices than Apple’s system. The result of all this attention to detail, claims NAD, is the “best sounding smart music system in the world”. Perhaps that’s going a bit far but, as we said at the outset, the Viso 1 is certainly hugely talented. It sounds massive, for starters: even in one of our biggest listening rooms, it can muster bass to humble its rivals. There’s tremendous agility and grip to its bass, too. It doesn’t wallow its way through rhythms, and there’s a fearsome intensity to its approach with music such as Rage Against The Machine. The soundstage it can conjure is just as hefty, with instruments carefully placed within a tall, wide and room-fillingly cohesive presentation. Of course, not everything in music is driven by volume and frequency extension, and with more spare, vocally driven tracks, the Viso 1 continues to entice. Some folk might prefer the Geneva Model M’s more focused presentation and its crisper treble, but there’s nothing wrong with the way NAD goes about its business. In fact, it’s a very commercial and appealing balance, with just the right amount of zing (and no more), plus a naturally warm and inviting vocal character. Perhaps that doesn’t necessarily fully exploit the sonic potential of 24-bit files, but it does mean that the NAD is an enjoyable and forgiving listen, even with Bluetooth-streamed Spotify. As you’ll have gathered, we’re seriously impressed. 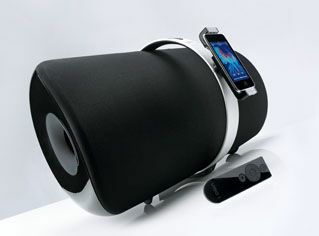 If you’re after a new iPod dock, you owe it to your ears to try the Viso 1.